FIBER DH PILLOW (16 X 24 X 4.25") - Highest quality fiber fill pillow filled with Dacron Hollofil fiber. Non-allergenic, resilient, odorless and long lasting. New Anti-microbial fiber. Ordering Info. PETITE PILLOW (13 X 19 X 3.5") - Made for small adults and children. Also great for travel. Ordering Info. TRAVEL PILLOW (18 X 12 X 4") - Great for use while traveling, watching TV, reading, or napping. Use it in the hotel, automobile, or airplane. Provides support and comfort in a compact size. Ordering Info. INFLATABLE NECK TRAVEL PILLOWS - Our inflatable crescent shaped mini-pillow is the perfect travel comfort companion for your neck. Use it to cradle your head and support your neck when traveling in a car, bus, plane, boat, or train. It's great at home for napping, watching TV, or reading in the yard. Ordering Info. CUSTOM VITALFOAM MEMORY PILLOWS - A true HIGH DENISTY 5.25lb Viscoelastic Memory Foam. Revolutionary technology shapes to the head and neck. It reacts to the temperature of the body to form to the head and neck, giving proper support while maintaining softness. Helps with Headaches, Neck Pain and insomnia. Hypoallergenic, anti-bacterial/fungal. Standard 20x13x4" Ordering Info. MEMORY LITE PILLOW - Same Revolutionary technology as our Memory Pillows, but in a lighter visco-elastic foam. It reacts to the temperature of the body to form to the head and neck, giving proper support while maintaining softness. Helps with Headaches, Neck Pain and insomnia. Hypoallergenic, anti-bacterial/fungal. Ordering Info. MEMORY PLUS ADJUSTABLE PILLOW - Memory pillow with the ability to increase the support and height with changeable inserts. Adjusts easily to 3,4,5 and 6 inch Heights. Comes with an extra set of firm inserts for additional height and support. Ordering Info. MEDIFLOW WATER PILLOW - water base, provides outstanding comfort and responsiveness for your head and neck. As you roll from back to side, the water instantly adjusts to maintain correct head and neck support and outstanding comfort. Ordering Info. FIBER SUPPORT ROLL (JACKSON PILLOW) - (16.5 X 7") - Filled with ultra soft fiber fill, this pillow forms to fit your neck, back or legs. Great for lounging or napping. Ordering Info. SUPPORT ROLL PROTECTIVE COVER - Royal blue cotton/poly cover designed to fit over Support Rolls to keep them clean. Ordering Info. MEMORY LITE NECK ROLL - (18 X 4" , 5" or 7" Round) Same Revolutionary technology as our Memory Lite Pillows. It reacts to the temperature of the body to form to the head and neck, giving proper support while maintaining softness. Helps with Headaches, Neck Pain and insomnia. Hypoallergenic, anti-bacterial/fungal. Ordering Info. 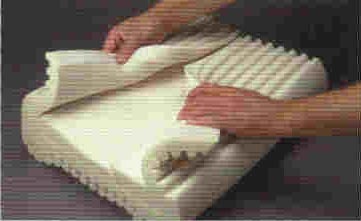 PILLOW ROLL (3 X 20") - Economical way to provide cervical support when used with conventional pillows.. Covered in a cotton/poly fabric. Ordering Info. 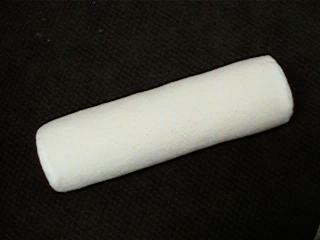 FOAM SUPPORT ROLL (14 X 4") - Shapes to fit any area of the body that requires extra support. Use it on the neck, lower back or legs while relaxing or sleeping. (Royal Blue, Khaki, Black, Navy Blue, Pearl Gray) Ordering Info.